Of the remainder, 39% are the sites of individual congregations. A full analysis of these sites (39 in total) is yet to be done, but the majority are independent evangelical churches, with a handful of Baptist churches. They include very few indeed from Anglican, Roman Catholic or Methodist congregations. Given that at the time of writing the Evangelical Alliance has a membership of 3,500 individual congregations, the magnitude of these numbers suggests that anti-evolutionism is a minority view even amongst evangelical churches. 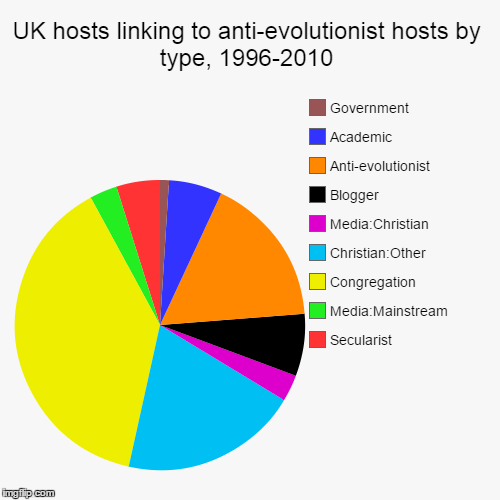 As might be expected, a significant proportion (17%) are other anti-evolutionist sites; a later post will explore the nature of this particular network. Interestingly, few inbound links are from secularist organisations, other than the British Centre for Science Education which exists to document (and counter) creationist ideas. Once data is available for the period after 2010, it may be that this interest grows as the schools controversy mounts. There are also very few links in from the mainstream media, which might also be expected to grow after 2010. A complaint often heard from anti-evolutionists is that the scientific “establishment” does not engage with the critique of evolution which is being offered. That claim would seem to be confirmed here, as both the proportion and absolute number of inbound links from academic domains are also very small. In sum, this data would suggest that between 1996 and 2010, British creationism was talking largely to itself, and was mostly ignored by academia, the media and most of the churches. which tells you that in 2010, the Internet Archive captured 20 individual resources (usually, although not always, “pages”) in the Church Times site that linked to the archbishop of Canterbury’s site. (i) that a host “abc.co.uk” held the same content as “www.abc.co.uk”. (ii) that the Internet Archive were no more likely to miss hosts that linked to these sites than ones that did not – ie., if there are gaps in what the Internet Archive found, there is no reason to suppose that they systematically skew this particular analysis. (iii) that my sample of four target sites was reasonably representative of the movement as a whole. It is therefore possible that the profile of inbound links is very different for another hosts of the same type. (iv) the analysis does not include cases where a site moved from one host to another during the time period. The host URLs used are those in current use, and so if another host linked to a previous host and that link was not subsequently updated, then that linkage will not be recorded in this data. (iv) that the inconsistency in deduplication at the British Library noted here does not affect this analysis. Thanks for this post, interesting approach. If you don’t mind, I have some questions; you write “Of the remainder, 39% are the sites of individual congregations. A full analysis of these sites (39 in total) is yet to be done”. Does this mean your analysis concerned 100 websites in total? Is that a lot, or a few? And are there differences in how often certain websites link to these anti-evolution pages? Many thanks Max for your comment. I didn’t go into the significance of the absolute numbers because it is not yet clear what a high, medium or low number of inbound linking hosts might be. There just hasn’t been enough use of this data so far to get a sense; my only comparator is this earlier post on the archbishop of Canterbury’s site, which had more hosts linking to it as you might expect, but whether this is as many more as we should expect, I don’t know. On the number of times each site links out: there are two ways into this. One is to look at *for how long* a linkage persists (which one can do from this data, but I haven’t yet). The second is to look at how many links there were at any one time from one host to another. These numbers are declared in the data, but would only be meaningful if you could also understand how many pages the linking site had in total. That is rather more difficult, and involves some triangulation with other data that the BL provides.